Camp: The Most Fun and Biggest Extended Family You’ll Find! Before setting off for camp, some campers and their parents wonder about how they will fit in, since it’s natural to try and imagine new experiences ahead of time. However, like most adventures, camp often turns out to be wonderful in ways that can’t be completely anticipated! If you’re still wondering about going to camp, you’ll be interested to hear about the experience of India (9) and Athéna (6), who crossed the Atlantic from France to attend Camp Weequahic last summer. Well, at first the plan was for India to go to camp, but after watching the Camp Weequahic video and getting goosebumps 10 to 20 times, Athéna became determined to go with her sister. Their parents did a lot of research and supported the girls going to camp 100% — a combination that led to a fantastic summer camp experience for the whole family! The girls’ mother Shaila-Ann, looked for a camp to meet her specific criteria—a camp that was not too big, near a major airport, co-ed, and with tons of new activities for her child to experience. Shaila-Ann also feels it was important to choose the camp before presenting it to the children (especially for those as young as hers), so they felt secure with a decision made by their parents and didn’t feel pressured by such a big question. She also reports that looking back, using online resources like the video “really gave a feel for the actual camp experience,” and allowed India and Athéna to participate in the process. The family met camp directors Cole and Kate at an information meeting. They immediately felt that Cole’s criteria for choosing staff was in line with their values and could see that he was fully dedicated to camp and facilitating a caring family environment. These parents especially felt that nobody could “pull the wool over Cole’s eyes” and this gave them “tremendous confidence in taking the leap of faith to send the children to a place [they] had not visited themselves.” Once at camp, the girls felt included and supported by camp staff and other campers, which is what their parents had predicted! The girls were happy and their parents enjoyed that reassurance with so many miles between them. 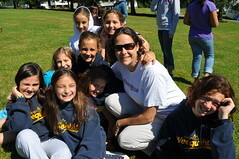 Camp Weequahic is committed to caring for individual campers and creating an environment where campers grow and friendships blossom. 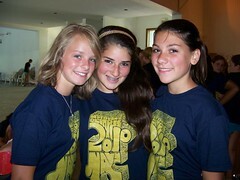 Camp staff are trained and dedicated to helping campers feel included and encourage campers to care for each other. This reciprocity of sharing/caring is core to the whole inclusive experience and foundational to developing capable children–even as young as India and Athéna. Now that’s kid power! Do you have a similar story to share? 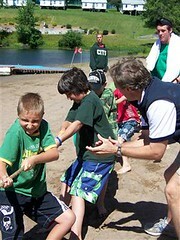 How has summer camp shaped independence in you or someone you know? Thanks Shaila-Ann, India and Athéna for sharing your adventure–and well done girls! 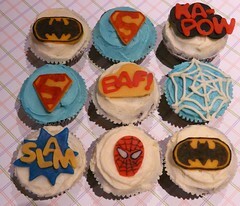 Thanks for the images gardener41, Michael Oh, and Sugar Daze (f/k/a LittleMissCupcakeParis). We started a new tradition at Weequahic a few years back that I look forward to each day while at camp: getting each camper’s happies for the day. Every night, I go through the boys bunks and ask for their two favorite memories from the day. I often get a lot more than two! These happies run the gamut – activities (especially waterskiing and tubing), playing on a team, getting up on stage, the recently completed Evening Activity, chicken nuggets for lunch, etc. This is my way of saying good night to each boy at camp and represents one of my favorite responsibilities: really getting to know our campers. Our female leaders at camp do the same for the girls. It’s so ingrained, in fact, that some families have started to do it at night in their own homes. I love it!! Focusing on your favorite memories at the end of a day gives you a leg up in lots of areas. 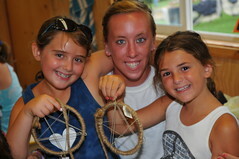 First, it helps our campers who are missing home focus on everything great they experience at camp. Secondly, they have to think critically about their day to find what they were happiest about. Finally, it helps focus the mind on gratitude towards others. None of these ‘happies’ are created in a vacuum! 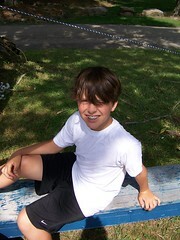 Activities were huge happies, especially waterfront, zip lining, and gaga! A great list from a great group of kids. Thanks to everyone for sharing! We’ll continue to ask for everyone’s favorite memories each day (staff – you, too!) this summer. Make sure you are thinking about it before you head off to bed. In fact, I suggest you start practicing at home right now! Have you ever dreamed of adventure?! Have you ever wondered what life would be like in the Poconos? 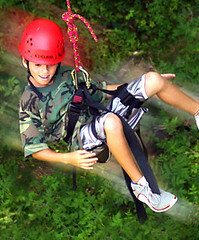 Have you ever wanted to do awesome sports, eat great food and live in fantastic cabins (great for relaxing)? 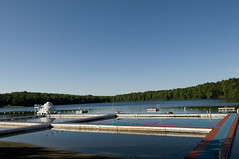 The best place to be is Camp Weequahic! 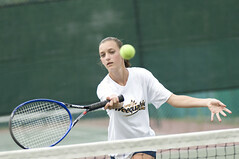 Did you know Camp Weequahic offers more than 10 sports? Wow!!!! I can do a lot of water sports like swimming, tubing, wakeboarding, fishing, and waterskiing. I can also hike, do archery, gaga, soccer, gymnastics, roller hockey, track, football, and more. 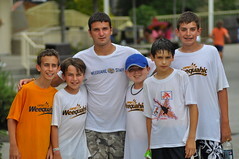 Camp Weequahic is the perfect place to learn and find a new favorite sport! But if I do so many activities I’ll need a good meal. Weequahic is a marvelous place to find delicious foods! I can dig my fork in a plate full of salad. Or maybe twist my fork in a plate of spaghetti. Or maybe try a soft warm pizza. And for dessert: chocolate chip cookies, cookies, brownies, and more. And on my birthday, I get a big homemade cake to share with your cabin mates. After a long day, I’ll probably want to head down to my comfy cabin for some well-deserved rest. Comfy cabins with roomy beds and a beautiful bathroom, Weequahic has it all! I can share a room with all my friends my age and have a fantastic game of cards. My roomy beds are comfy and just like at home, not stiff or too mushy but just right for me! At evening time I can plop down in my bed then take a breather for the night. As parents, we are always on the lookout for experiences that help our children learn new skills. 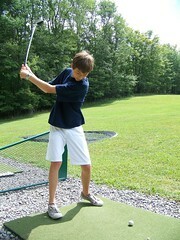 We enroll them in music lessons, martial arts, sports, theatre, choir and, of course, summer camps. But we all know that the best programs (and the best educational experiences) are ones that go beyond the basics of teaching skills to help develop our children’s character. The basics of character — trustworthiness, respect, responsibility, fairness, caring and citizenship — are all essential ingredients in summer camp experiences. “Camp teaches values such as self-esteem, teamwork, and caring — areas where traditional schools sometimes cause more detriment than good. And camp allows everyone, not just the top student and the best athlete, to thrive and enjoy the process of learning,” says Peg Smith, CEO of the American Camp Association (ACA). Everything we’ve written about on this blog so far — being ready for camp, unplugging from the digital world, traveling to camp, developing interpersonal communication skills, interacting with camp counselors, participating in camp traditions, and learning new sports and skills all contribute to building character. When mom Martha realized that her son Jaden had come home with crucial life skills — taking care of himself and making good choices — she knew that camp had served a crucial role in his life. “I felt like they were living a free life,” she says. The rules were there, just not stressful. This kind of independence creates the necessary space for the foundations of character to blossom. “I could not believe the person he had become – just a new person – totally confident in himself,” she says. It’s no surprise, really. Camp activities, to be successful, require all the participants to have self-discipline and an unselfish sense of camaraderie. “There is just something about living with a group of boys,” mom Wendy says after sending her only son Justin to camp for the first time. Living communally in cabins and bunks requires teamwork, creativity and a willingness to work together. The camp directors, staff and counselors deserve much of the credit for the character development Martha and Wendy saw in their sons after just a few weeks at camp. They work hard to develop programs that bring a diverse community together around common values and goals, and everyone benefits – campers, parents and staff, and the world they come back to each fall, bringing their good character with them. 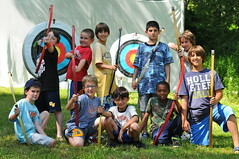 Camp is about educating the whole child and allowing them to flourish, so that we all as a society may do so. In an earlier blog we wrote about how to judge whether or not your child is ready to go to camp and pointed out that it really depends on your unique child and their level of maturity. One mother, Christine, puts it this way, “each kid is different…each mum is different …so I do not feel I can really give blanket advice. . .” However, Christine’s 12 year-old son was ready to go to camp—so ready that last summer he came to Camp Weequahic from Switzerland and arrived without knowing a single other camper! Christine decided instead to look for a “really American camp” on the internet and spent a lot of time researching and comparing her options. 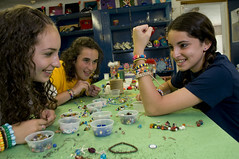 What guided her final choice was the Camp Weequahic website with its video clips, and she was drawn to the camp’s obviously family atmosphere. After all, she was sending him a long way to try different things and have new experiences! Since Nicolas travelled from Europe, a three-week session seemed the perfect fit—two weeks seemed too short and four weeks seemed too long for a first time camp experience across the Atlantic. Christine’s nieces both had a wonderful camp experience in the United States, but Christine felt that Nicolas would be more open to forging friendships and getting to know American kids, if he ventured on his own—and every mother understands that each child is different! Nicolas completely agreed about coming to camp on his own and since he was a little familiar with American culture and speaks English, that’s what worked for him. In Geneva, Nicolas has developed friendships with students from all over the world and his mother’s commitment to raising a globally-aware child was well under way, but coming to the United States added a whole new level of intercultural awareness. For example, camp gave Nicolas time to develop deeper relationships with Americans his own age and broaden his knowledge about the game and traditions of baseball. He also experienced cultural details that a tourist might miss. Nicolas loved Camp Weequahic so much that he wants to return and is now dreaming of coming back as a CIT (Counselor in Training). His younger brother has also caught camp fever and wants his turn as a camper too! No matter how many miles a camper literally travels to camp, the adventure stretches them in many ways and contributes to measurable personal development. Campers return changed from both travel and their personal journey–and in Nicolas’ case, even more fluent in American English! 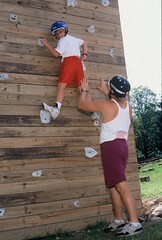 Have you sent your child on a long distance to camp? How did the experience help your child develop self-reliance and skills? How did you decide what your child could handle? Thank you so much for sharing your story, Christine and Nicolas! What do you get when you put nine kids and three young adults into a room for 21 days with no computers, cell phones, or video games? Well, in the best circumstance, something pretty awesome: a whole bunch of new, lasting friendships! In my experience, the single biggest worry children have in going to camp for the first time is “will people like me?” They are going away from home and mixing it up with children from all over the US and, possibly, even other countries. Let’s face it, it’s a big deal! We’ve found that speed at which campers build friendships is directly related to their feelings of comfort at and enjoyment in camp. Be Kind. I know it sounds funny and probably too simple	but it works! Going into a new situation, the best way to show you are open and interested in building friendships is to treat others as you would want to be treated. For 99.9% of us, that means a smiling face, a kind word, and being included. Be Yourself. Sure, you can go off to camp make up a new ‘you.’ However, I’ve found it easier and more successful for kids to be simply themselves. You’ll have more than enough time for everyone to get to know and appreciate who you are! Be Present. The idea is to be truly at camp, engaged in what the bunk or group is doing, and not sitting on the sidelines or with your mind wandering elsewhere. You’ll be surprised at how much fun you’ll have doing the most random, goofy things at camp. Speaking of fun…. Have Fun! The more fun you have with the kids around you, the more likely you are to building lasting friendships. Notice I said “with.” Enjoying a laugh at someone else’s expense is never a good way to make a friend. Remember idea #1! The Counselors. How does the camp interview, hire, and train their staff. When you speak to families currently attending the camp (and you should), ask them about their child’s experience with the staff. These young men and women will have a tremendous effect on the campers’ ability to build friendships. The Program Day. Being together all day, every day can be tough on friendships, even new ones. Through experience, we’ve found a day where campers get to spread out away from their bunk from time to time provides a healthy mix of new and known experiences. This leads to more stories, more excitement, and more interesting interactions. Atmosphere. Is the camp, well, campy? Do they sing goofy songs, create time for unstructured (but supervised) fun, instill a joie d’ vivre for everyone? 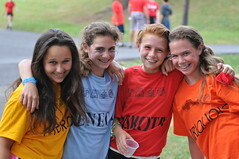 While this list is not exhaustive, it does touch on the more important aspects of building friendships at camp. 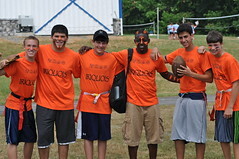 It’s something we work hard on at Weequahic and can’t wait to do it again next summer!